Leisure’s stunning range combines the very best concepts of style and innovation, offering budding chefs a complete kitchen solution. Exclusively available at AO.com and designed by internationally renowned and award-winning designer Patricia Urquiola, we have prepared the ultimate kitchen partners for you. A strikingly beautiful design, coupled with innovative technologies, means our new range has been created to bring every adventurous foodie’s dream kitchen to life. "The main idea of the concept is to develop a line which is contemporary but not over-designed. My particular philosophy for the range was to work on innovation, technology and performance, with a design that isn’t pretentious, not difficult to use and works every day." This is how architect Patricia Urquiola shares her inspiration behind our new range. Born in Oviedo, Spain, Urquiola now lives and works in Milan. Having been nominated for and won various international awards, her designs are displayed in museums’ permanent collections around the world. Her unique approach to design is exactly why we have worked with her to provide you with the most elegantly useful products for your home. Choose from our two beautifully designed single ovens or opt for our impressive double-oven if you prefer the extra capacity; they are all built-in and will fit effortlessly into your kitchen. Featuring large capacities; touch screen displays and easy-to-clean interiors, our range of ovens will help you along on each and every one of your culinary adventures. Attract all the right kinds of attention with our range of Patricia hobs. For a more traditional cooking experience, choose our 5 zone, strikingly designed double-ringed gas burner. 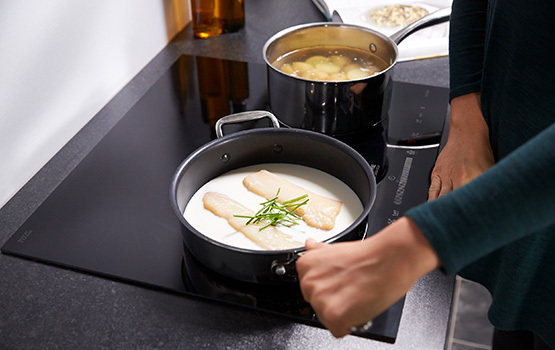 If you prefer a more modern addition to your kitchen, opt for our feature-rich, touch control frameless induction hob. Add an elegant final touch to your kitchen with our Patricia designed Leisure integrated cooker hood. Equipped with an inverter motor, the low noise level ensures your dinner guests won’t ever be interrupted whilst at the same time ensuring the air in your kitchen is kept clear as you cook up your feast. All talented home cooks know that the quality of their dishes depend on the quality and freshness of their ingredients. Create a true statement in your kitchen with an American-style fridge freezer, including a perfectly placed mini bar to be used for all your daily essentials. This fridge was built with all of your foodie needs in mind, including blue light technology, which will maintain the vitamin content in your fresh produce and a chiller zone to keep your meat and fish at the optimum temerature. If you prefer a more streamlined look to your kitchen, our integrated fridge freezer is the choice for you. Put all of your culinary tools to rest at the end of your cooking adventure, to be cleaned and refreshed in our Patricia Urquiola branded built-under dishwasher. With a large capacity, its features will keep all of your dishes, glasses and utensils clean and fresh and its sleek tinted glass design will never fail to impress either. A tinted glass door without handles, a perfectly placed mini bar, a new suite of built-in products; these are just a handful of the aspects that have been meticulously planned and created to add an appealing abstractness into your home.